The budget or cheaper smartphone market is booming and every smartphone company is interested in making a mark in this category and with the launch of smartphones priced $40 with the Firefox OS which was supported by Spice and Intex, Android One is going to be entering the market officially with the release of the first set of Smartphones running on Android One OS. Android One was first talked about in the Google I/O conference some months back and they put forward their idea of entering the affordable or making smartphone cheaper to get to the majority of people who are not into smartphones yet mainly targeting the Rural areas. The devices are said to be priced around $100 and will be sporting Stock android One like the Nexus series sported Stock android OS without any Skins. 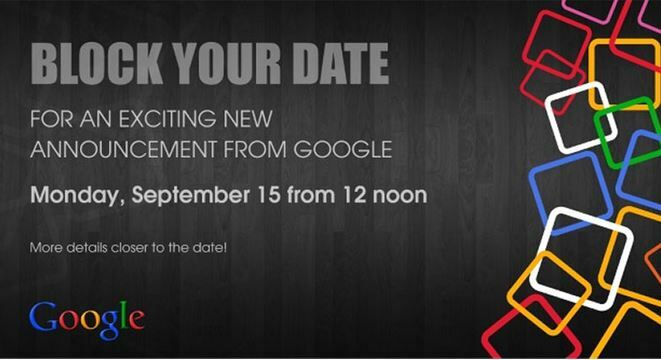 You can see the invitation in the image below which reads “Block your Date” for an exiting new announcement from Google on Monday September 15 from 12 noon. The pricing of the smartphones having Android One was rumoured to be very cheap but recent rumours suggest that the device are going to be priced around $100 which cannot be confirmed at the point and only waiting till Septemeber 15th can confirm the pricing of these devices. But listening at what Sundar Pichai, Senior Vice President at Android, Chrome and Apps at Google recently said that “the company will not subside Android One hardware”. Pichai hopes that by sharing resources between Google and the OEMs, the companies would be able to keep the total cost of manufacturing within the previous announced limits.